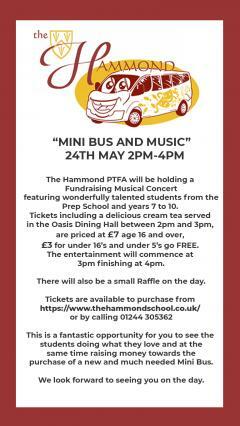 The Hammond PTFA will be holding a Fundraising Musical Concert featuring wonderfully talented students from the Prep School and Years 7 - 10 of The Hammond. Tickets include a delicious cream tea served in the Oasis Dining Hall between 2pm and 3pm. There will also be a small Raffle on the day. This is a fantastic opportunity for you to see the students doing what they love and at the same time raising money towards the purchase of a new and much needed school Mini Bus.